GROESBECK, TX. (WTVR)—After some applied pressure, the White House announced that beer enthusiasts might soon get their hands on the presidential recipe. Jay Carney, White House spokesperson, recently announced on Twitter that the administration will unveil the beer's recipe once a petition for the request receives 25,000 signatures by September 17. President Obama made headlines when he revealed he drinks beer that's specially-brewed in the White House. “It is ice-cold and tasty,” the president said about his preferred White House Honey Ale. Beer fans immediately started begging for the recipe but Mr. Obama has declined to release it. A White House petition was started, in hopes of getting the information. Limestone County Assistant District Attorney Brody Burks, who is also a home brewer, drafted up a Freedom of Information Act request for the recipe. A picture of the FOIA was placed on Reddit, and that's when the story went viral. The Texas man thinks that this is the best way to obtain the recipe, because if said recipe exists as a federal document, the government is required to release it. "I brew my own beer in my backyard. So I figured maybe I could learn a few things from our president," Burks said. Thousands have signed the official White House petition that Carney mentioned. Right now the petition has just over 9,100 signatures and so it needs more than 15,000. 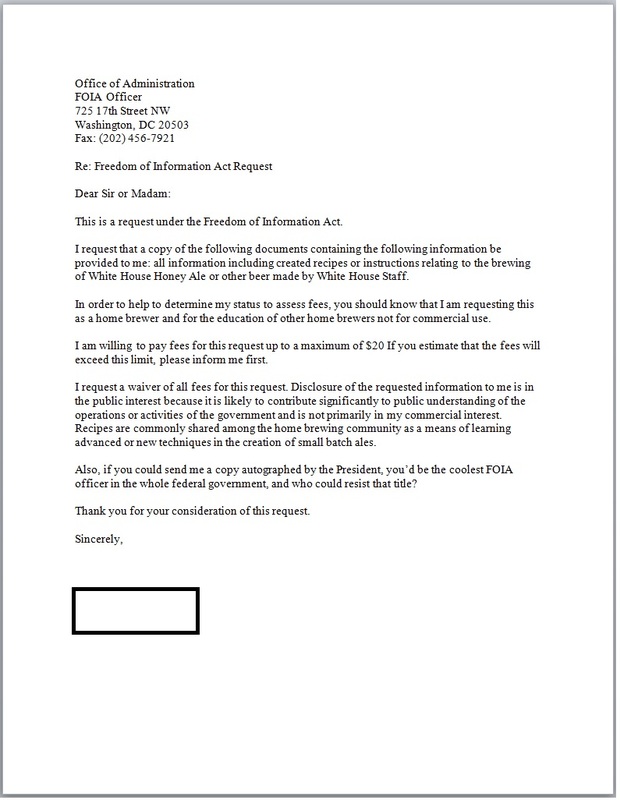 Under the Freedom of Information Act, The White House has ten days to at least respond to Burks’ request. Until then Burks is keeping his fingers crossed. "My beer is OK, but I would like to try the president's to see if it's any better," Burks told CBS affiliate KWTX. One known element, aside from the hops, is the honey that comes from bees that live on the south lawn of the White House. *Editor’s note. This article, based on information from affiliate KCBS/KCAL, named Scott Talkov as the person who originially filed the FOIA. It turns out that Talkov has also filed a FOIA for the recipe. He did so after Burks filed. CBS 6 apologizes for any misunderstanding.